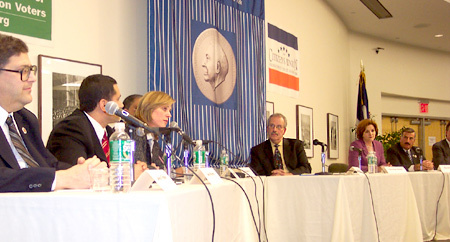 On November 17, 2005, seven New York City Council members, hoping to be selected as the next speaker, addressed a public forum, sponsored by Citizens Union Foundation (publisher of Gotham Gazette), the League of Conservation Voters, and Baruch College. The speaker candidates included Leroy Comrie, Bill deBlasio, Lewis Fidler, Melinda Katz, Christine Quinn, Joel Rivera, and David Weprin. Doug Muzzio, professor of public affairs at Baruch College, moderated the panel. - WHY SHOULD YOU BE SPEAKER? - WHAT LEGACY WILL YOU LEAVE? WHY SHOULD YOU BE SPEAKER? Doug Muzzio:First question, why you as the speaker of the City Council and not one of these other folks? Lew Fidler:Other than “boxers or briefs,” this is the only question we should have been prepared for tonight. Let me tell everyone a little about Lew Fidler. I’ve been involved in civic affairs for my entire life. I grew up in a house where my mom was the president of the PTA in every school I went to. My father was the founder of the local civic association. I went to New York City public schools, graduated from SUNY Albany, NYU law school, and I was admitted to practice law at the age of 22. I returned to the neighborhood that I grew up in. I’ve been a community board chairman; the vice president of a local community development corporation; the founding director of a neighborhood housing program; counsel to a police precinct council; counsel to a public housing tenants association. Public service has been my life. I returned to East Flatbush and married my lovely wife Robin who is here with my son Harry, who is also a public school student. My other son, Max, graduated from New York City public schools. I am invested in the city of New York. I am invested in its future. I am not running for speaker of the council because I want to be something else someday. I think that that is important that my colleagues on the council understand. That will truly allow me to empower them. The ideas of 51 members; not the ideas of one. That can be cultivated, grown, and brought together so that we can act effectively to be a counterbalance to an administration that the charter already puts most of the power in. This administration came in with the arrogance of a billionaire. And will precede the next four years with the overconfidence of what I think was a tissue thin 20-point win. Joel Rivera:First I want to thank everyone for coming this evening. We are discussing something that is extremely important to the city of New York. I want to thank the parties that organized this event because they do have the foresight and they do understand that this process is very important. The speaker is very important for the city because it is the second most influential position next only to the mayor. Like my colleague just stated, we have a mayor-strong city. We have a legislative body that is extremely important in terms of the budget process and the land use process and how we deal with priorities facing our residents, our 8.1 million residents. The reason I believe I would be a great speaker for the 51-member body is because I understand the need for access. I know that when Councilmember Robert Jackson, or Simcha Felder, or the council members who are here tonight come to the speaker’s office and say we need to talk about policy, we need to talk about budget priorities when it comes to housing, healthcare, education or economic development, my door is going to be open. I would make sure that access is something they are going to have every single day of the week. I am not running for the mayor of the City of New York, so this will not be my platform. I believe the central staff is there to work on behalf of the members. Not only are they there to be part of my staff, but they are an extension of the members’ staff in City Hall. They will work with them on important issues in their districts and in City Hall. We need to make sure that the discussion and the debate is something that takes place every day. I think we can all agree that New York City is a great city and has a bunch of tough complex issues. I know the members of the City Council will join us in our crusade. Melinda Katz:I want to thank the organizations that pulled this together. And I especially want to thank my colleagues for coming out. In the end, they are the ones who will vote for speaker and vote for the leader of this body. I also want to thank them for giving me the best four years in my entire career, or my entire life. The last four years have been unbelievable on a personal level and for the City of New York. We came in when there were 38 new members of this body. Everyone thought the world was going to be destroyed. Everyone thought, “Oh my God, 38 new members are not going to know what to do.” As we go forward tonight, looking for change and what we want to keep in the council as rules, we all owe a great debt of gratitude to Gifford Miller, who truly pulled this body together when it was brand new - 38 new members was not easy and he had an enormous task. We can talk tonight about our experience. I was in the New York State Assembly. I had the privilege of serving under two speakers in my career, not only in public service, but in private practice as a mergers and acquisitions attorney. I see this city as the great city that it is. I want to make sure that the city gives credibility and confidence to the businesses all over the entire United States, so that they come here, so they want to build here, so they want to bring their employees here, and invest in our future. Our future is what needs to be protected to make sure people want to stay here and keep this city the great city of New York that it is. Doug Muzzio:Leroy, see what you can do. Leroy Comrie:I want to thank all of the people who put this event on this evening. I want to thank the audience. Your representation here shows that New Yorkers are truly interested in the public process and making sure that the council, which is the legislative body of government, is deliberative, open, and able to work with the entire culture of New York. This is a beautiful city that we are in. This is a city that I have invested my life in. My two children are here, eight and 11 years old, who go to public school. My wife, and my mother, who is 80 plus is here visiting from Florida. I can tell you that after four years as speaker of the City Council I want to make sure that I leave a legacy that my children can be proud of. That my mother, God willing, will still be here and be proud of. That everyone who comes to this city can be proud of. We are in a critical time in this city. We are facing financial crisis that we have to face. We have to stop working with one-shots and really help stimulate small business. We have to encourage creative development. We have to be a proper and active advocate for every person in this city that wants to come to the council. The council has to be a welcoming place. The council has to be the city’s advocate. I am proud to work with everyone in this room over the past four years. It’s been the greatest experience of my life and I want to continue to do so. Christine Quinn:I also want to thank the groups and Baruch for pulling this together tonight. For the past seven years, I have had the honor of serving on the City Council. For the past four years, the great honor of chairing the health committee. In that time I have developed a level of experience and I think, demonstrated an inclusive leadership style. The type of leadership style, which attempts to bring all the stakeholders to the table so that we can develop common sense, implementable solutions to the problems which face this city. And we have been able to do that. Working together, we passed the citywide smoking ban. Working with Councilmember McMahon and others, we were able to pass legislation that protects our children’s health by putting a nurse in every elementary school. And working with Councilmember Robert Jackson to pass landmark equal benefits bill. I am running for speaker to take that experience and inclusive leadership style forward to help work with my colleagues to solve more of the problems that loom in this city. For example, the budget deficit. We need to take the very effective work the council has done on the budget, and expand that. We need to begin to truly address the capital budget and become less responsive and defensive in our budget work, and be more offensive, putting our own plans out there. In addition, as speaker, I would hope to expand the amount of strategic planning that we do in this city. For example, we should have a five-year plan for pediatric preventative health care. So I hope as speaker to work on those and many other issues with my colleagues and with the many advocacy groups in this city. David Weprin:I too, want to thank the sponsors tonight, Baruch College, Citizens Union, and the League of Conservation Voters for hosting this very unique forum tonight. Christine referred to the budget deficit: maybe if we would have charged admission tonight, we might have had a head start. I too want to recognize my wife, Ronnie and my daughter, Lori. Over the past four years, I have had the honor of representing my district and the City Council as the chair of the council’s finance committee. During that time, I have helped lead the City Council through extremely challenging times and have gained extensive experience that will be invaluable as the council faces future budget deficits. Working with Speaker Miller and a spectrum of my council colleagues, I have successfully navigated the council through four, on-time, balanced budgets in the post-9/11 era when the city faced multi-billion deficits. I have helped pass important fiscal initiatives, like the city’s Earned Income Tax Credit, which has helped hundreds of thousands of low-income New Yorkers. I have advocated for increased funding for every council members’ district. We have stood up to the mayor when he tried to cut funding to the education capital budget. In addition to my City Council experience, I will use my background as an attorney, my 15 plus years as a investment banker in municipal finance, and my previous banking department experience as a deputy in the department to effectively work with Wall Street and the investment community and fighting for increased federal and state aid that we are entitled to. As speaker, I will always be accessible, fair, and honest. Bill deBlasio:Thank you to the organizers and my colleagues. I have been honored to spend the last 20 years in a wide range of public service roles in this city. It has been an extraordinary experience. And I believe I do have the experience and the ability to lead this council and help it to continue a process of evolution that was begun almost 20 years ago under the leadership of Peter Vallone, Sr. I have three particular things that I think we have to focus on in this next term of the council. I think we have to build more of a sense of unity and common purpose among all of the council members. I think I have to work, if I were to become speaker, to help each other succeed in the work we do in our neighborhoods. And I think that in everything that we do, we have to be clear that we have to balance the power of the council more strongly with the power of the mayor. And that is why I think next year, after extensive public debate, we should move forward to add an additional four year term to our current term limits as council members. If we do that, and we continue the process of strengthening the City Council, we can be a good partner to the mayor when he is right and be a stronger check and balance when he is wrong. This council succeeds when each individual council member succeeds in the work in our neighborhood. And each individual member succeeds when the council as a whole improves its public reputation and its ability to get things done for the people of all of New York City. I hope to lead the council and bring my experience to bear on that. Doug Muzzio:Since Bill began answering the second question on term limits, we'll work back this way. The question to all of you is: As speaker, would you support or advance changes in the current term limits law will allow longer service for council members? Second part, if so, how much longer? And finally, how much should these changes be accomplished, by council or by voter referendum? Bill deBlasio:I think next year after extensive public discussion, after extensive hearings, I think we should move forward with an additional four-year term through the legislative process. I think that's so important because council members must work across mayoral terms. The charter, I think, has not provided the proper balance between the mayor and the council. I think that something we also have to work on, but certainly as we've experienced term limits we've learned that in practice it further saps some of the councils ability to play the role of a strong legislature and a strong check and balance, and that's why I think adding an additional four year term would really create greater balance and allow members to gain additional expertise and strengthen their role. Doug Muzzio:How should it be accomplished? Bill deBlasio:Through legislation, after a full, public debate. David Weprin:Well, I'm philosophically opposed to term limits. Having said that, the voters did vote twice and we should be careful before we deliberate and make any definitive decision. Certainly, I'm very open-minded on the subject. The term limits originally passed in 1993, it's already 12 years. There're a lot of pro's and con's to term limits. One of the pros, of course, was fresh faces. People, as Melinda pointed out, predicted chaos. It didn't happen. I think it worked relatively well. At the same time, by having term limits, you empower the mayor to a greater extent than is probably necessary in the governmental process. So there are a lot of pro's and con's. I think it is something that should be discussed by all our members. I think it's something the new council should discuss at length. Members should contact their constituents, discuss it with their constituents. We should hear from the public. We should have extensive public debate and be open to suggestions on change. Doug Muzzio:Do you support or oppose extending term limits? David Weprin:At this point I'm open minded to both. Doug Muzzio:On the third question, if this happened should it be by voter referendum or council legislation? David Weprin:Again, I think it is something to be discussed. If there is legislation proposed, I think the legislation should be taken on the merits when it's introduced. Christine Quinn:I also oppose term limits for some of the reasons David mentioned and others. I think it doesn’t allow elected officials enough time to become experts on the issues we need to be experts on in the legislature. And also, it does overly empower the staff...at city hall. I think we should make changes to term limitations legislatively. It is an issue I would want to discuss immediately with my colleagues if I were elected speaker. I'm inclined to think 12 years is the right timeframe, but I'm not committed to that because I think it really is a decision we all have to come to collectively in the new city council. Leroy Comrie:I opposed term limits from its inception. I think it hurts emerging and minority communities. It creates a bureaucratic super class of people that New Yorkers can't touch. People that New Yorkers can't reach out to and people that start to control their information flow. I think term limits have hurt the city; it hurt new members coming in. I can tell you as majority whip with 26 years of council experience I was able to help a lot of the new members because they did not understand that there were major projects in theur district that they would have lost because the information flow went from staff down or lobbyist down to new members. Term limits hurt communities because you don’t have a chance as an individual unless you're an insider to touch a bureaucrat. Such an agency ought to have real discourse. You need a councilmember that is engaged in the legislative process that can survive the term of a mayor. In order for real engagement and real public process, we need to have an open public debate on it because everyone you talk to privately does not like the idea. Doug Muzzio:How much longer and how do you do it? Leroy Comrie:I think we need to have open public discussions, larger than tonight, throughout every neighborhood. I'm not committed to a time frame. I think we have to have major public discussions. Doug Muzzio:What about the method of adoption? Leroy Comrie:I think the method of adoption, after public discussion, most people would allow a legislative solution if we have real public discourse. Melinda Katz:When I was a New York State Assembly member, I think it was 12 years ago, or 10 years ago, and it was on the ballot, I wrote letters in opposition of term limits. I never cared for them. I thought we had term limits. Those are called elections, which the U.S. House certainly proved a few years ago. I believe the term limits hinder the ability of the council to negotiate with the mayor. There is no co-equal power with the mayor of the City of New York as long as every eight years this body will be changed. In 2001, 38 new members came in. This year eight new members came in. In the year 2009, 38 new members will come in again, according to my calculations. Unless we make this term at least one more term than the mayor of the City of New York, I believe it is nearly impossible to be equal with the mayor. The staff has the history, it has the experience. It knows the legislation that was passed a few years ago. We cannot get our capital projects through because by the time we are in our fourth year we are looking toward our next career. So, I would use legislation to make sure our term was at least one more term more than the mayor of the City of New York. Joel Rivera:Thank you very much. I think with the discussion here tonight something is going to get done with term limits. But the fact of the matter is, me personally, I'm opposed to term limits as well because I understand the fact and the need for experience in City Hall. The fact of the matter is we don’t have the advantages that a mayor does have coming intoâ€¦ because we don’t have an effective transition team working with us to get us on track and how to deal with the intricacies of government, like budgetary issues. We have a $50 billion budget that we have to really work with every single day in the City of New York and it was experience. The question has to be when you go to a dentist do you want somebody straight out of dental school, that maybe has to figure out "what does this instrument do?" or do you want someone who has experience, has been around for a very long time, who understands the intricacies of it? I think we would want the experienced dentist, and I think the same thing would go for elective government. We want someone that understands the intricacies that understands how to handle the agencies that understands how to navigate the bureaucracies because we are lobbyists on the panel we represent 165,000 people in our districts and they deserve the best possible representation. Joel Rivera:That's up for debate. We could either do it for one more term or let the natural democratic process take place and repeal it. Lew Fidler:I have always voted against term limits for many of the reasons my colleagues have said. I will start backwards and tell you the one thing I would not do, is repeal them in their entirety without a referendum by the people, because although I respectfully disagree with the vote of the people, I think it deserves some consideration. I didn’t think the problem with term limits was all the fresh faces coming in, it was the problem at the end with us all going out. And does everyone in this room realize that the speaker that we elected if we don't extend term limits, and will be electing forever, will be a lame duck speaker who has to go into an executive with extra power. So I am inclined to four more years. I am inclined to do it legislatively, and I think that answers the question. Doug Muzzio:The next question is a question of substance and policy, and we will begin with Joel. It deals with solid waste. Do you support the current solid waste management plan, and in particular its proposal of exporting garbage from the city? Second part: are there significant elements of the plan you would like to see moved, modified or added? Joel Rivera:Thank you. I think that garbage is very expensive in the city and we’ve got to figure out a way to deal with it in a very cost effective manner. It’s a very dirty issue, obviously. We’ve heard about it over the past couple of months at City Hall; there’s been a lot of debate over it. But the fact of the matter is we have to do something. We don’t have enough land in the city of New York to dispose of our garbage. We need to find a way to cart it out. The fact of the matter is we have to find a way to 1) retrofit our marine transfer stations and make sure they containerize; 2) we have to make sure that we find a way to have a stronger recycling program so we can minimize the amount of waste that goes into our landfills. If you look at the amount of plastic, metal, and glass going into our landfills it’s unbelievable. Third, I actually have a bill called the grinders bill, which would in effect take away 40 percent of the organic waste going into our landfills. It’s in effect in other major municipalities, it would be a tremendous plus for our city, and I think we should implement it as soon as possible. I would urge the other members of the city council to join me and to pass this very important bill. Melinda Katz:For those of you who are heavily involved in the council you will know that this is an issue we have been dealing with quite a bit. I clearly don’t have all the answers on the issue. I do believe, as I think do most of my colleagues, that we need to figure out how to export the garbage from the City of New York. As Councilmember Rivera said, it’s an expensive process. But there’s so much more we can do. We need to figure out how to continue the infrastructure, and expand the infrastructure for reuse, for waste disposal, for recycling. We should be able to at least double the recycling that we do in the City of New York, and it’s a shame we don’t do that on a regular basis. We need to have zero waste goals, and we need to make sure that we are out there actually doing the press on it, making sure people understand it. We’ve had fights on it in conference, where we were discussing whether or not we need to give up recycling or whether we need to give up some of the pickups for garbage. To give up recycling pickups is just an amazing consequence to me. You’re going to give up so much money, not to mention the environmental consequences. Clearly we’re going to have to deal with the Solid Waste Management Plan again, coming up in the next year. I hope that the administration this time does not put us on a time frame with the ULURP [Uniform Land Use Review Process] process, which I believe was the big issue the last time around. I look forward to having a discussion when we don’t have a gun to our head to make sure that the ULURP process goes forward. You do the Solid Waste Management Plan first, which is how it should have been in the first place. Leroy Comrie:The Solid Waste Management Plan and the solid waste issue in the city is a critical issue in terms of our economic development. As you know, right now most of the solid waste is concentrating in minority communities, with over 65 waste transfer stations primarily in minority communities. It’s one of the singular issues that I’ve been involved with since I’ve been in the city council, because one of my biggest parks is located right across the street from eight 24-hour waste stations. So my community insisted that I get active in this, and I have been active in this program. So while I support the mayor’s solid waste program, there are some things that need to be adopted. We need to make sure that there is real public/private partnership in this issue. One of the problems with the marine transfer stations is that the tipping fees are going to be too expensive for most people to participate in. We need to get closer to borough self-sufficiency; we need to make sure there’s more recycling, at least double the recycling efforts we’re going now; we need to incorporate new technologies that have been proven to work. We need to have a real discussion with the council raising the bar on awareness so that we can deal with waste management in the city. I’m trying not to go over time, but there’s a lot to be said on this issue. Doug Muzzio:Thank you, I know. Chris? Chris Quinn: Thank you. This is one of the biggest issues that’s going to face us in the next few years, and it’s important that we actually have a truly developed, multifaceted plan to address the city’s solid waste problem, a plan that, as Melinda referenced, goes beyond ULURP sitings. That plan needs to first and foremost recognize that for decades solid waste and other facilities have been placed in low-income neighborhoods of color. We need to address that history of environmental racism as it relates to siting of facilities. We also need to make sure that the plan demonstrates a real commitment to reduction of waste, reuse of materials, and expansion of recycling. The plan also needs as it looks at siting look cumulatively at the impact, not just limited on the impact of one facility. For example on the west side of Manhattan there have been as many as three sites proposed. Some of those may be exactly the right sites, but if you’re going to have more than one, you need to look at the totality of their effect, and also their effect on adjoining facilities like parks. I have a similar situation to the one that Leroy referenced. So I hope that we see a true plan that we can all work on to improve and expand upon in the next city council. David Weprin:Thank you. Clearly this is a major issue that we are going to be confronting in the next city council, and we need to have a balance between cost and environmental issues, and of course we need to have more recycling in the city. The mayor made a major mistake in his first year in office, during our first budget crisis. The mayor suspended recycling. That was a big mistake, and he did it on the basis of economics. Sure enough, though, our fiscal analysis has shown that he actually cost the city more money by cutting recycling. Because of the overtime in the sanitation department, it was actually a huge failure, and it took awhile for people to get back into the habit of recycling again. There’s still a huge confusion factor. I’ll never forget that senior citizen who told me that he heard we were going to suspend recycling glass for a year, and he said he didn’t know what to do because he doesn’t have enough room in his garage to store all the bottles for a whole year. We clearly have to do something. Doug Muzzio:Thank you, David. Bill? Bill deBlasio:Well, Doug, I do support the solid waste plan, and it’s not an abstraction for me, in fact the Hamilton Avenue marine transfer station is walking distance from my house. I do think that we have do improve certain elements of the plan. I certainly think we have to make sure that each site as currently planned will be workable. I think there are still outstanding issues in terms of traffic and in terms of impact on surrounding neighborhoods. We have more work to do to make those sties are workable as possible. I think we need to make sure that overburdened neighborhoods have very clear guarantees that things are about to change. I think the way we do that is through legislation. I think we have to set numerical goals and timelines for ensuring that we actually achieve this transition away from neighborhoods that have carried this burden â€“ overwhelmingly neighborhoods of color â€“ and ensure that we do move this plan along and move the waste in a more equitable fashion. I absolutely believe that we have to put more focus on recycling, and that means more public education and more of a real enforcement effort, and finally a true citywide effort to reduce consumption. Lewis Fidler:Thanks. I voted no on the city council, but that was because I supported the solid waste management plan. I found the idea that they brought us half a plan, and then said â€trust us, we’re going to do the rest’ to be somewhat offensive. I do believe, for the reasons that our colleagues have stated, that we have to move our garbage out of the city of New York more efficiently and more fairly. I don’t think that garbage is endemic to only low-income neighborhoods. I think we need to find a way to share that burden in every borough fairly. So yes, I’ll support the whole plan. As long as my colleagues have brought up the issue of recycling I also found the suspension of recycling in this city to be offensive. As a civic leader, I fought to bring weekly recycling back to Brooklyn. And by the way if the mayor again suggests cutting sanitation pickups in the outer boroughs to one day a week he’ll have a fight on his hands with Lew Fidler again. Doug Muzzio: The Budget. The city faces a $4 billion dollar budget deficit in the next fiscal year. It's going to require either raising taxes or fees or service cuts, likely both. Will you cut or will you raise taxes? Melinda Katz: I think one of the problems we have, is that every time we have a budget deficit we go to taxes. We don't go to Albany where we should be going and get commuter tax. The mayor of the City of New York says he goes to Albany, he asks for the commuter tax, and time and time again he gets turned down. I served in the Albany Legislature. I know exactly. They need stuff from us, we need stuff from them. If we want the commuter tax put back on, we are going to have to negotiate it, and negotiate it right. Number one. Number two: higher taxes don’t normally generate more income for the City of New York. We are now giving back $400 tax rebates a year to the people of this city. We are spending a lot of money doing that. We haven't lowered real property tax, which is something I would certainly like to do. I think that would generate more people to stay in the City of New York and actually spend money in the City of New York. I think one of the problems we also have is that there's institutions like the Campaign Finance Board, where the City Council has absolutely no authority to lower the funding they get every single year. According to the City Charter the Campaign Finance Board can set their own budget. And unless we change the Charter, it can't be lowered. We can lower the Fire Department, we can lower the Police Department, we can lower Health Care, but we have no authority over that. And I think that's one of the issues as well that we might want to discuss. Later right? Melinda Katz: I'm telepathic that way. Doug Muzzio: My question to all of you is: Does it add up to $4 billion? Leroy? Leroy Comrie: What we have to work on in the next year is, as Melinda said, is the fight to make sure that we negotiate to have a commuter tax from Albany. We also have to look at the various city agencies. I have to say that our council finance staff has been excellent at preparing secondary budgetary response to the budget. We also have to work with other good government groups who have come up with various ways to ensure that there are opportunities for people to pay taxes that would not hurt the middle class or working class of this city. That would not fundamentally take away from people who want to do business in this city. That would not fundamentally hurt people that are looking to make sure that New York is a place where we have a high quality of life. Who do we get up to $4 billion? We need to encourage business stimulation. We need to help Wall St, because we're ultimately dependent on it, but we can't let it get weaker. Of course we need to encourage affordable housing and new housing development. We need to make sure that what we do in the city council is raise the bar and have market discussions to make sure that what we come out with - the Council Alternate Finance Budget - which has been actually very responsive, and we have a great finance team. And we make sure that that budget is the budget that is adopted. Doug Muzzio: The $4 billion? Leroy Comrie: We'll get the $4 billion. We did it after 9/11. Christine Quinn: For the past four years and at different points, we have also faced huge deficits. And the Council has made some very clear statements about our values. About the fact that we won't let the budget end up being balanced on the back of the neediest New Yorkers. As we move forward with this deficit, we need to make true to that. That we cannot cut away the most needed services. But, we also need to recognize that we have a great deal of property tax payers after 9/11, and we cannot go back and again raise property taxes as a way to get out of this budget deficit. In addition to going into agencies and really routing out that there might be waste or duplication of services. We also need to look at how we can increase revenue in this city. For example, as it relates to the Health and Hospital Corporation; the vast majority - all except for one - of the insurance companies that get the great contract of covering New York employees. They won't except HHC patients. If I wanted to go to Bellevue and City Hospital, I couldn't get my insurance to cover it. That's a significant amount of money that's being held out of city coffers. We need to look at ideas like that as well to bring in the $4 billion dollars. Doug Muzzio: Thank you Christine. Dave. David Weprin: We have to bring back the commuter tax. I'm glad the Mayor finally came out on the commuter tax - I think it's a little late, not to late - but we had an opportunity after September 11th to lobby effectively for the commuter tax, for a similar commuter tax to what we had. It would have resulted in $500 million a year. By now it might have been up to as much as $800 million a year. Clearly we have to get together and work hard. We have to get more aid from Albany and Washington. We contribute $18 billion dollars more to Albany and Washington in taxes than we get back in services. We have to work together with our Congressional delegation, our Legislative delegation, with the Mayor, hand in hand, and fight for the money we are entitled to. We also have to bring in the private sector, and labor and we have to all work together as a team and effectively fight for the money we're entitled to. We also have to encourage new industries, such as the film industry. I'm very proud to cosponsor the film tax credit that we did for 12 and a half million dollars for companies that film 75% in New York City. We have to encourage new industries. Doug Muzzio: Thank you. Bill. Bill deBlasio: Doug, first and foremost we have to be responsible. We have to preserve the revenue we have if we can't get ourselves out of this. We have to keep the property tax rate where it is. It's not going to be lower, I don't think it should be higher either. We have to continue the PIT surcharge on the highest income New Yorkers. We also have to play some of the roles I wish the mayor would play more often. We have to foster real public debate on Medicaid reform, one of the biggest challenges facing the City's budget. And we have to organize a real movement to ensure we get the security aid we deserve from Washington. Those are the types of fundamental changes that might give us additional hope of fiscal stability. To the extent that we ever have to confront cuts again, I hope we don't get to that point, but one thing we can all realize, is no cuts whatsoever to our public schools or to our public safety. Lew Fidler: $4 billion in 60 seconds responsibly is not possible. I agree with a great deal of what my colleagues have said, but lets be honest: as long as George Bush and George Pataki are the people we're going to, the George Washingtons that we are entitled to are not coming here. So I will say this, we must absolutely preserve public safety, we must absolutely preserve education, we must absolutely preserve health care, and our safety net for our poorest New Yorkers. But we also have to be mindful that we have been taxed, fined, and feed into oblivion in this city, and we cannot drive people out by raising those things further. There is one tax that I think we should have imposed, that we didn’t and that would be the absentee landlord surcharge on Class 1 and 2 property owners. People are using their private homes as an investment property not residing there, not having they're family live there, could raise $70 million in the City of New York. And that could lead to a piece of that $4 billion. Doug Muzzio: This is an unscheduled..
Joel Rivera: I never get to go. Doug Muzzio: Oh! Joel! I'm sorry. Joel Rivera: Thank you, Doug. First. I want to say that as the chair of the State and Federal Legislation Committee in the first year, one of our key priorities is go down to Washington because as you know we send to Washington about $18 billion dollars a year that we do not see back in service or programs. Now that's a large number, if we talk about dollar for dollar, we send to much money over to Washington. Then, on the state side, you know we have Elliot Spitzer coming around the corner, you've got to think we've got a better chance for our city to get more state funding. But we do have to make sure we do reinstate the commuter tax. That is a small investment for people who are making a substantial amount of money here in the city of New York to contribute to the services and the programs we have in our city to make it a greater place. We also have to create a city tax commission, I believe. Because with that, we'll be able to look at the disparities that exist in terms of the property taxes, in term of the personal income tax and the sales tax. New York City is becoming unaffordable, and we can \not tax our people any more, because like Council member Fidler said and Council member Melinda Katz said, we are going to drive people away. So my belief is, we cannot raise taxes. We have to find priorities within the $50 billion budget, and get more money from the Federal and State side, to make sure that we balance our budget. We are responsible, we've done it over the past four years under Speaker Gifford Miller, and we'll do it again. Doug Muzzio:Thank you. As I was saying, I'm going to violate one of my own rules. An obvious Lightning Round question: and that is, commuter tax. Did you inhale? Lew, did you inhale? Is this realistic? Lew Fidler: Are you asking about the commuter tax, or something else? No, I don't think it's realistic. It should be. Joel Rivera: I believe it is. Melinda Katz: I'll remind you that we've already gotten several things that we weren't supposed to get. Yes, it's negotiable, it's realistic, you can fight for it. And if the State of New York needs anything from the City of New York, they had better do that for us. Leroy Comrie: I agree with Melinda, we need to have the city council and the city force the state's hand to give us the commuter tax. We've got to do it. Christine Quinn: We need to have a bipartisan united mayor and city council. Yes, it's something I think we could achieve. David Weprin: Yes we can achieve it. We have to work together with the business community, with the labor community, with all parties, with the mayor hand in hand, and I think we can do it. Doug Muzzio: Bill, can we handle it? Bill deBlasio: If we organize a campaign so that the public of this city ensures that every candidate for Governor, for Assembly, for State Senate, this is a litmus test in their races, then we can get a commuter tax. Doug Muzzio: Thank you. Leroy - subject of question: property tax. Should the city mitigate the difference in property tax rate between Class 1 (that is one, two, and three unit residences) and Class 2 (all other residential units including rental, coop, and condo). Should there be equalization, or something approaching it? Leroy Comrie: We at the City Council have been working with how we can come up with mitigation, but we have to realize that the class one owners have been the people that are taking the largest hit in the property tax rate over the past four years. And when we had the increase it hurt those people the most. The Mayor did come up with the $400 rebate to try and get some relief. We do need to realize though, that the second tier of property owners, Class 2, are becoming a larger group in the city also, because we're converting a lot of warehouses and commercial space. We have to find a way to mitigate it, and look at spot mitigation when necessary for those areas that have been converted from commercial areas to residential areas. There is a way to do it. We've been working in the City Council, we've actually just passed a tax relief opportunity for both Class 1 and Class 2 homeowners, just today, or just yesterday. It would give them $140 million in relief. So there are ways to do it. We need to make sure that whatever we do, we do it in a judicious manner. Christine Quinn: Carolyn Maloney used to say "A home is a home is a home, and that we should treat them all the same." I think that it's very important that we figure out a way to address the inequity that has existed for Class 2 owners, and also for renters. Who end up getting passed along through the Rent Guidelines Board process. I think it was the last year of the Dinkins Administration there was a commission set up by Mayor Dinkins with the Council and the Department of Finance which began - in tremendous detail - exploring how that equalization could happen, in a manner that didn't put all of the burden on Class 1, because that isn't fair either. I think we need to go back to that work - so we don't recreate the wheel - and figure out how we can move forward on those recommendations, and others, in a way that brings fairness, but not putting it all on Class 1. But, the discrepancies between the two Classes for owners and renters verses condos and coops, is very significant, and something we need to address, and recognize the significance of condo and coop owners in this city. David Weprin: We actually had a two hour forum, right here at Baruch college, on this very issue. So it's kinda hard to do it in sixty seconds, but I was very happy to sponsor legislation yesterday. We actually save Class 1 and 2 homeowners and coop owners $203 million dollars collectively. Clearly there are problems with the way that properties are taxed and the equalization issue. But let me say this: I just told by tax assessors- off the record- that since single family homes are only assessed at 6% of market value, while coops and condos are assessed at 40% of market value. That is strictly done by computers now, as far as one and two family homes. Tax assessors are spending all their time on commercial properties. The computers are told to take into consideration that it's only 6%, and as a result, the market values have been going up and up and up. There are homeowners in Queens that are at the poverty level of senior citizens living in million dollar homes. And that's a problem to. Doug Muzzio: Thank you. And Bill. Bill deBlasio: Doug, in the last four years representing my community in Brooklyn, I have learned so much about what home owners face every day in New York City to make ends meat. I fundamentally believe that homeowners bore the burden and saw us through the fiscal crisis that we went through a few years ago and we simply can't push them more, can't ask them for more. I think our recent action, on Class 1 and Class 2, was right and appropriate. We talk about some things that can bring better fiscal stability to this city and I think a lot of solutions are doable if we have the will. And if we can create a time of greater fiscal stability, I think we can really then focus on greater relief for renters, and for businesses in particular. But until we get to that point, we've got to honor the folks who got us through the tough time, and are really the backbone of our tax system. Doug Muzzio: Thank you. Lew. Lew Fidler: If mitigating the discrepancy between Class 1 and Class 2 property owners means reducing taxes on Class 2 property owners, I'm Okay with that. If it means shifting the burden to homeowners in the city, then I think that's a mistake, because as Bill said we've already shifted as much to them as we possibly can. We did pass property tax relief yesterday, and I voted for it, I think I actually added my name as a cosponsor to Dave's resolution. But the fact of the matter is, we pass that resolution, and the next tax bill that I get in the mail - my taxes are going to go up. And I called the system Byzantine, it's a State formula that is - if you want to talk about being the exact opposite, the antithesis of transparent. This is Byzantine. I do believe that there needs to be some general reform of this process that we can assess taxes clearly, and in the amounts and percentages and formulas that we intend to. Doug Muzzio: Thank you. Council member Rivera. Joel Rivera: Thank you very much. I think that when you're talking about taxes, you're talking about something that not many people enjoy talking about, so I'll try and make it as painless as possible. I think that, now, I agree with my colleagues, when you're talking about mitigating the tax burden you want to make sure that you don't mitigate it by increasing the burden for those who have lain the foundation for us, and have made our city as great as it is today. What we have to do is have a city Tax Commission established, that can actually look at the disparities that exist between one, two, three family homes and coops and condos and commercial properties and manufacturing properties, because that's how you're gonna be able to get a real clear determination on what needs to be done. There's gonna need to be public input in that process. And that's why one of my goals will be to advocate the establishment of a City Tax Commission. Melinda Katz: You know, I think this is probably one of the most difficult questions to answer today. Yeah, we just yesterday revamped Class 1 and 2 and put the burden onto Class 3 properties. Because the increase in value of properties in Class 1 and 2 went up so enormously compared to the other properties - and I think that that's something that we should be proud of in the City of New York. So, the values of our homes are going up, our constituents are getting taxed higher and higher, but they're still only getting taxed the assessed value, but quite honestly, when I open up my tax bill, like a lot of single family homes, the only thing I notice is it's going up. Again. And Council keeps telling me they're not raising taxes. And there's something wrong with a system like that. I do agree that we need to revamp this entire system. We came into this body, and we had to learn about capping, and changing the burden from Class 1, 2, 3, and 4, and it really has to equal one number, and you have to start with that number and you have to work backwards. This would be a perfect reason why we have to extend term limits. Doug Muzzio: And the next series of questions are really process questions in council operations. I begin with you Chris. What changes if any would you support or advance in the structure or the operation of the council. Christine Quinn:Well, there are a couple of different things that I would advance. But First, I think all of us in the Council owe a debt of gratitude to the Fresh Democracy Caucus, which came in four years ago and ushered in important rules, reforms that really democratized the City Council. And it's appropriate now, at the end - another term - to sit down and review those rules to see how we can make the Council even more efficient and even more open. Three things that I think would be good for us to do. One, if I were elected speaker, I would immediately stop the practice of Speaker-mail. I would only mail to my district. Everyone should be able to communicate, and has to communicate with their constituents, but there's no need for me to communicate as Speaker to people in other districts. Also, we need to set up a system so when members request legislation, there are timeframes and milestones by which they which they get drafts back. If you submit a legislative request, you know you will be getting a bill. Also, we need to open up the process by which bills evolve from introduced versions to A versions, and as those versions change, give written notification to members, and also post those changes on the Council Internet so the public and advocacy groups can monitor their evolution. David Weprin: We've actually under Speaker Miller, opened up the rules quite a bit. The problem is not so much the actual rules, but the culture at the City Council, which is obviously very speaker oriented, very central staff-oriented around the speaker. I think it a matter of changing that culture and I, as speaker, would be willing to do that. I think we should have weekly conferences. Right now we have Steering Committee members. I think we should continue to have a steering group, but at the same time have weekly conferences of all the members to get their feelings on the agenda and get a consensus before we actually take a position. A major complaint of members is that they often won't know what's happening at a council meeting until the day of the council or certainly the day of the committee meeting. That should never happen. No member should ever have to learn about an item from the press. They should know about it before hand. Bill de Blasio: I agree with David on weekly meetings. I think that would be a great step forward. It would improve communication. It would improve members’ ability to really buy into legislation, really critique legislation and make a better consensus, a better product. I agree with Chris on ending Speaker Mail. I believe those resources should go to council members so they can better communicate with their communities. I think we need to have a strong committee system. I think we need to further strengthen committees by allowing committee chairs to hire their own counsel whenever possible. I think we should see committee chairs as cabinet secretaries who each have an area of interest and expertise, who help build a positive agenda for the council, a proactive agenda for what the council should do each year, and present it to their fellow members. We do need to have a strong speaker. We do need to keep very high standards for the work we do in our body. We do need to ensure our legislation is responsible and has been vetted at the highest levels legally so that it can withstand court challenge and that is a role for a strong speaker and is also clearly a role for a more open process. Lew Fidler: I'm a big believer in de facto over de jure, and when we sit down and discuss rule changes, sometimes someone proposes a rule change and we say, "but that is the rule." The fact of the matter is there are a number of things that we can do better, and I believe that we should have a strong speaker, and the way that speaker is strong is by making sure that every member feels that they are being worked with, not on. That means a speaker meets with members every week or two individually. What's your project? What's your idea? How do I assign staff to you to make your idea a reality? Because we have 51 ideas and they need to come up to the top. That’s what would make a strong speaker in this council. That’s the change that we really need to see. We need to get all 51 members in the game. Joel Rivera: I think that what we have to realize is that the city charter grants the mayor a tremendous amount of power in the city of New York, and we have to be very mindful that when we're talking about the rules of the City Council. We don't want to tie our hands, as a legislative body, behind our back while we're dealing with a $50 billion budget process and what I think it has to be is access. We have to make sure that every single City Council member understands that the speaker's office is there to work on their behalf. The central staff is there to work on their behalf. Often we will do that on a day-to-day basis. We need to make sure that we listen to the ideas that each and every councilmember brings forth to the City Council. And when it comes time for the budget, what I would do if I was speaker is to sit down with each and every single one of the committee chairs and discuss the budget items that reflect the concerns of the committee to get a better understanding of what they feel, since they are the committee chairs, on what our budget should look like for their committee and for their environment of expertise. That’s what I feel it is about. A speaker is about leadership, it's also about being a uniter and we have to unite the entire body to make it a good check and balance against the mayor of the city of New York and the only way to do that is to empower through access. My vision of the City Council is to be a co-equal entity to the mayor of the city of New York. If we are not co-equal we will get absolutely nothing in the next four years when this mayor does not have to run for re-election. Already in the rules right now is that a chair can pick their senior staff member. Already in the rules right now is that the staff serves at the request of the chair. Already in the rules is that you can get a hearing within 60 days. I agree with Councilman Weprin, it is the culture of the institution that doesn't allow these rules to be used properly. It is just like creating stricter laws that are already unenforceable. We need to empower our committee chairs, our colleagues in the New York City council, because they bring with them a host of expertise that can be used in negotiations. We need to empower them, not only with negotiations with the speaker, but to be able to negotiate with the mayor of the city of New York because their expertise should match the expertise of the mayor's side. We need to allow councilmembers to serve the government more than eight years so their expertise is not lost after eight years and we also need to strengthen our legal team in the New York City Council. I believe that the council's probably one of the best councils that there is out there. The mayor has used an abundant amount of money to make sure he has the expertise on his legal counsel. Our council also needs this assistance, and councilmembers need to know that they can rely on it. The speaker needs to be strong because the body's strong. If we don’t hang together, we will certainly hang alone. Leroy Comrie: We need to make sure all 51 members are empowered and engaged in the legislative process. As the other members have said, clearly, we have to be the proper advocate to a mayor that is term limited and in order to do that, we have to have a transparent process. There are actually all of the rules that are needed for open discussion are available right now to councilmembers but a lot of people don’t realize it. First, the Democracy Council, which I was part of at its inception, along with many members that are here at the table and other members in the council, actually opened up the rules. In the course of doing things, a lot of members didn’t look at the rules, or still haven’t looked at the rules. You can actually amend bills from the floor now. You can make substantive changes before the bill has gone to the amendment stage, but members didn’t look at it and members didn’t realize it. Members didn’t want to engage in that process. We have to eliminate that. I'll make sure that what we do in the council engages the public. We can no longer have a bill that passes in 12 hours. We can no longer have major legislation that passes without public comment. We have to have transparency because the council has to be unified. Every member has to be engaged. We have to ensure that the entire city is engaged in our process so that we can be the advocates for the people. Doug Muzzio: Given the importance of process and operation - and you've heard a large number of suggestions here - I'd like to move into a quick answer round, so that on at least some of these we have one set of coherent statements. Do you favor changing the council's current practice or culture of not allowing amendments from the floor as part of the debate on a proposed bill? Lewis Fidler: Well, it's a matter of culture, and yes. Doug Muzzio: Yes or No? Doug Muzzio: Apparently there is a current practice - it's part of the culture - where amendments are not allowed. How would you deal with the culture? Melinda Katz: I would not let amendments from the floor. I would strengthen the committee process, and I think that if it's from the floor, the committee process is flawed. You would have no negotiations on a bill, no research would be done, and I believe it might be a very dangerous process for the institution. Doug Muzzio: That was good in ten seconds. Leroy? Leroy Comrie: I would also strengthen the committee process, but we actually can do amendments from the floor now. Doug Muzzio: It's a matter of the culture. Leroy Comrie: I would definitely change the culture, because there should be no member who feels disempowered to get to the council and not be able to impact a bill. That's a horrible way to do it. Christine Quinn The best place to amend a bill is certainly in committee. That's where you have more substantive discussion, and I hope that making the evolution of bill versions open to the public and clearer to members will help make changes in committee. But certainly we have the right rule, which says that any bill can be amended on the floor, and members, if a bill gets to the floor and they're dissatisfied with it, need to amend a bill if they believe the bill isn't what it needs to be to serve the city. Doug Muzzio: So the answer is yes? David Weprin: I would favor amendments on the floor as a current rule. The problem is that you don't want to have people not as knowledgeable as they should be make a decision on the spot, which might not be the decision they would make if they had all the information and discussion on both sides. So I would work through committees as much as possible but in certain cases I would allow amendments on the floor. Doug Muzzio: So you would move the culture in that direction? David Weprin: I would move the culture in that direction, but also encourage more amendments in committee. Bill de Blasio: Yes, as would any legislator in a democracy. What we also have to do is weekly conferences so we're debating these issues in advance and ensuring that we understand what members' concerns are and hopefully shaping legislation in a better fashion. Doug Muzzio: I'm going to start with you, Bill. How many days before a stated council meeting should a meeting agenda be posted on the Web? How much lead time? Bill de Blasio: I'd like to see it be the week before. David Weprin: More than we have now. At least a week. Christine Quinn I agree, I think at least a week. I think a week is the right time. Leroy Comrie: One week, and I would just like to say that I think we should never allow any member to feel disempowered. Melinda Katz: I'd like to talk to my members and get their opinion on that topic. Joel Rivera: I would say five business days. Lewis Fidler: Six days, 23 hours and 43 minutes. Doug Muzzio: A wise guy! Lewis Fidler: There has to be adequate notice, not just to the members but to the public. I honestly can't tell you that I have thought about this for one second before I heard that question. Doug Muzzio: We'll start with you again; we'll pick on you. Do you favor a public accounting at the start of each fiscal year - early July - on all member appropriations by district? In other words, a public accounting immediately after the budget goes into effect talking to the member item appropriations? Lewis Fidler: I get that first? The problem is that I don't think you can actually do that because there are member items that span council district lines, there are member items that are shared by council members. What you're looking for is a report card of who got what, and I just don't know that that's possible. Joel Rivera: First and foremost I want to hire you to the New York City Council if I become speaker because you ask good questions. Back to the question at hand: What we need to do is show an open and transparent process. We have a good committee structure where public debate can be made, but I don't think you can start it off in July. Melinda Katz: I would agree with Councilmember Fidler. We all get our books of expense budgets and capital budgets, and we all look through it before the budget is actually passed. It would be impossible to look through it district by district, and anybody who wants to bother to look it up can actually find it pursuant to where the money was spent. I would agree with Councilman Rivera that we have one of the most open processes with hearing and the budget - I'm stopping, I'm stopping. Leroy Comrie: I think your question really goes deeper than that. No member under my administration would not have the major projects they needed in their district; no member under my administration would feel disempowered by not getting the capital that they needed, by not getting the non-profits that they needed. That's really what your question is, that every member was taken care of and if their district's priorities were taken care of. It would happen in my administration. Christine Quinn I think Councilmember Fidler is right. The way you proposed to have reporting in that time frame district by district is not tenable and would not get the information that the question is heading for. It is important, as Councilmember Katz said, to note that the budget does list each group that gets money and how much they get. So that information is out there for the public. David Weprin: We actually have reporting now, and I was instrumental in budget negotiations to actually get more money for individual council districts for both senior and youth money. I argued for that extensively because I know what the members wanted to distribute throughout their district. It's a pretty open process now, and it's pretty hard to differentiate between major projects that overlap a lot of districts or Queens or Brooklyn-wide districts. So it isn't that easy. Doug Muzzio: Yes or no? You guys are taking liberty. David Weprin: Yes, with an explanation point. Bill de Blasio: Lew Fidler gave the appropriate and honest answer. Our current process is perfectly transparent. Doug Muzzio: That was good Bill. Lewis Fidler: I thought it was great. Doug Muzzio: The next question deals with campaign finance. David, you'll begin. The recent municipal elections raise concerns about the current campaign finance laws. What changes, if any, would you make? I'd accept the discussion of single or sole source since you guys went through this ad nauseam yesterday. David Weprin: Well, clearly when you're dealing with an opponent that is not part of the system, who has unlimited funds, as the recent election we just went through with the mayor of the city of New York, I would remove the individual cap on contributions for donors and go to a much higher cap similar to the one that's at the state level for the governor of the state of New York. Bill de Blasio: Our responsibility is to preserve and protect the campaign finance system. The city council created the system, the council has funded the system, the City Council has additionally found ways over the years to add strength to the system. It is a national model; we must stand up for it. Now, we have real challenges. A self-funded candidate is a huge challenge; we have to look honestly at the possibility of additional, greater matches of candidates facing self-funding candidates. We have to look at the question of bundling from all sectors - I think that an issue that has gone unaddressed. We have to look at the question of non-competitive races. We have to have clear numerical standards for determining whether matching funds are necessary or not. We certainly have to look at greater efficiency in terms of matching funds and on audits, and what we really need is a public process, a public commission of all the stakeholders - including the good government groups, the council members, the labor community, the business community, and of course the Campaign Finance Board - to determine the long-term direction for strengthening this program. Lewis Fidler: The big loser last Tuesday was not Fernando Ferrer, it was Campaign Finance. And until the Supreme Court revisits the issue of personally funded candidates, politics like polo is going to be a sport played only by billionaires. I'll probably end up with an audit now. The Campaign Finance Board in this city, both in how they treat incumbents and people who want to challenge incumbents, does not have a clue. They do not understand how campaigns are run, and therefore impose restrictions and raise questions that are not fair, not fair to challengers and not fair to incumbents. The first change I would make is that I would pass a law, and I would need state legislation to do this, that would allow a person to get immediate redress in Supreme Court when the campaign finance board threatens that they're going to make a ruling, like we do with petitions and petition challenges. Joel Rivera: I think that public finance, and the concept of it, is a great idea to level the playing field and to make sure that there's not a big distortion on debate. What we would normally hear about is the power of incumbency and the fact that insurgents or opponents cannot get their level of attention. So the idea is great. What we saw last Tuesday was the great failure of a great idea. And what we need to figure out is how do we address that issue. And it may be that if we have a self-funded candidate spending such an obscene amount of money that maybe we have to throw away the rulebook. Maybe we have to allow it to go to the state cap where we will follow the Board of Elections criteria of what can be raised within the campaign. That should be one of the options and avenues we take. We also have to make sure there's an appeals process, because I know a bunch of members and people who are not members have had disagreements with the campaign finance system because of the decision making process and how delayed it may be. We have to make sure that we have a comprehensive system that's not going to distort debate in New York and that's going to give the little guy a chance. And this time the little guy was the people in the city of New York. Melinda Katz: I think that the Campaign Finance Board is an organization whse mission is clearly flawed. It is meant to level the playing field. Yet we just had an election where a self-funded candidate spent, I believe, it was $70 million against the $8 million that the Campaign Finance Board gave to the candidate. That is not leveling the playing field, and that was their mission. Melinda Katz: I think that the Campaign Finance Board is an organization whose mission is clearly flawed. It is meant to level the playing field. Yet we just had an election where a self-funded candidate spent, I believe it was $70 million, against the $8 million that the Campaign Finance Board gave to the candidate. That is not leveling the playing field, and that was their mission. There is no oversight to this body. We don't call them in front of committees like we do the fire department, the police department or the department of health. I looked up on the computer just happenstance four months of Campaign Finance Board violations. Fifteen council members were fined out of 51. In four months. That can't be what the mission of the Campaign Finance Board was supposed to be. In times of record deficits, we cannot lower [their] budget without a Charter Revision Commission, which I think is outrageous. The mayor has to adopt what the Campaign Finance Board gives them as the budget. Not only that, six years ago, the council passed terms and conditions where the Campaign Finance Board was supposed to give us quarterly reports. It hasn't been done. We don't have it. It's not part of our budget anymore. And with all due respect to the legislation we passed the other day about unions - I think it was very good legislation - but I think we have to take an overall view of the Campaign Finance Board, study it, and make sure it's a fairer process to everyone. Leroy Comrie: I agree with everything that my colleagues have said so far. You know Campaign Finance was originally put together to enhance the opportunity for the public to participate in the political process. I agree that Tuesday's election only shows that Campaign Finance is fundamentally flawed. They've become rule makers, judge, jury, prosecutor, all under one shop. And because of that they have gotten away from their original mission. They've gotten away from making campaigns accessible to the public, they've gotten away from making campaigns a real opportunity to have public discourse. All of the major candidates that ran this year had last minute problems with Campaign Finance that were going to hold up their public monies unless they capitulated. That's a problem. All the council members that ran this year - and I know I'm getting an audit; my audit from '01 is still being held up. And that's the other problem with Campaign Finance: They are never wrong. Even when you go to them and you have a hearing with them and you win with the board, they reargue it and twist it. That's a problem. That takes away from a democratic process. I believe in the public process. I believe in Campaign Finance. I think that it's a wonderful program but they've gotten too far away from their original mission. We need to pull them back. We need to have open discussions to make sure that Campaign Finance is open and transparent. They've gotten away from their transparency. They've gotten insular, and they've started to hurt all of us. Christine Quinn The goal of the Campaign Finance program was to make sure, among other things, that average New Yorkers could have access to elected office, which is a very, very important goal to making government as responsive and representative as it can possibly be. And along the way, the Campaign Finance Board has gotten incredibly complicated, and presently for somebody to comply with all of the rules and regulations and paperwork you practically need to have a CPA as your treasurer. And I don't think the Campaign Finance Board completely accepts how much people want to comply but how difficult it is to comply. So we immediately need to, as Councilmember de Blasio said, convene all of the stakeholders to figure out how to streamline the system, not limit the amount of disclosure but make it easier so people can comply. Because I think what we risk with the level of complication that has now been built into the system and the degree to which there isn't timely response when candidates add questions, that creates the threat of New Yorkers who maybe aren't billionaires but who could raise the $200,000 on their own of opting out of the system. And when we see that trend, that is really when we'll see campaign finance begin to deteriorate and unravel in our city. Doug Muzzio: Wow. Big fans of Campaign Finance here. Bill, health care: As speaker, what specific steps would you support or advance to improve access to the health care New Yorkers need, particularly the underserved. Bill de Blasio: Well this is an example where our role as a check and balance on the mayor is going to be so crucial, and we have to be very strong about it. The mayor made an important campaign pledge to help enroll 200,000 children in New York City who don't currently have health insurance. I think the means are there. The eligibility is there. We actually have to do it now. That's going to be a huge undertaking. We have to hold the mayor's feet to the fire to ensure that that happens. I think throughout the work I've done on the General Welfare committee I've found one of our hardest challenges is linking up people to the actual benefits they qualify for and deserve, That involves a lot of public outreach and that involves a commitment across all agencies of government. I think again we also have to work on the Medicaid reform question. We have to be in the forefront of this national debate on getting localities their fair share and addressing what has now become a rampant fraud problem. We see it before our very eyes in our communities. If we don't fix that problem, we will not have the resources available to serve those in need. Lastly, language access. A problem in many, many areas, especially in health care. Insuring that no one is denied health care because of language barriers. Lew Fidler: Truthfully, the first thing I'd probably do is ask Christine Quinn. She is my health care guru. Seriously, I agree with what Bill said about Medicaid reform. This is not a problem that's just endemic to New York City. This is something we're facing across the country and the spiraling cost of health care is a huge problem. And access to it, not just for poor people but for middle-income New Yorkers is a real issue. I think the mayor said that poor New Yorkers get better health care than rich New Yorkers, and I think that's nuts. I think what we have to do as a council is make sure that our public hospital systems are maintained and kept open and that we're not closing even the small hospitals because certainly having the hospitals in our communities is absolutely necessary. And the second thing I would do is I'd pump as much money as I could into preventive services, particularly for children in all schools, not just public schools, because prevention here is probably the best way to save money in the long run. Joel Rivera: First and foremost I want to say that preventive medicine is far cheaper than reactive medicine. And that's why is important that what we do is that we make sure that the 200,000 children that need access to health care get that access to health care. What we need to do is at the same time make sure that we revamp our whole entire Health and Hospitals Corporation and do a study on how many medical centers do we have in every single borough in terms of per capita, per person, because there's a huge disparity. In some neighborhoods in the Bronx and Brooklyn and Queens you will see that the location of medical centers is very, very far away and inaccessible to public transportation. And that's key when you're talking about the health of our citizenship and our residents in the city of New York. We also need to make sure that we open the doors and make sure that there's a great education campaign to make sure people know about the ailments that can arise. Christine Quinn and I worked on infant mortality within the Bronx and the city of New York, which unfortunately is higher in New York City than it is in Cuba, and that's something that we really should be ashamed of. We had to look at the fact that when you're talking about cancer and diabetes and HIV and AIDS, you know the numbers are just staggering. A lot of it has to do with education and I think that's why we have to get out there on the streets. Melinda Katz: When I was in Albany, I had the privilege of being the chair of the subcommittee on urban health and there we did many hearings against the privatization of the HHC hospitals, the city hospitals all around the city of New York. We still don't have a contract now with the nurses at the HHC hospitals. They haven't had a contract in two years, and the last offer they got is an offer, which I think is outrageous. We need â€¦ nurses in every school in the city of New York. We had trouble getting a nurse in one of the public schools in my district this year. We had to call time and time again and have the parents do a write-in campaign in order to get the nurse that we had passed this legislation and yet they were allocated by the city of New York and by the New York City Department of Education. I think that's extremely important. I agree we need to do Medicaid cost containment. When we were in Albany, it was also a huge issue. It still is an issue. And to be honest about it, years later it shouldn't still be the issue that it is. Leroy Comrie: Access to health care as you know has been a major problem in this city. The information flow on access to health care has also been something that this council under Christine Quinn has been trying to improve. And I have to agree that she is the guru. She is the person that has helped me also with the infant mortality rates that have gone up and the asthma rates. She's been a tiger with this issue and we have to keep our feet to the fire by passing legislation and helping HHC improve but also trying to save the many private hospitals that have threatened to close. We have to work on Medicaid reimbursements. But we have to work on having a wider public discourse so that people that are taking their children to school can get access to health care information, that we can work on translation services, so that new immigrants can get access to health care information, that we really blend all of our public and private services together so that people can get access to information because we need to preventative medicine through communication. We need to get knowledge through sharing our resources. It's frustrating for me when I go to the communities and as many things as I try to do - I get a colonoscopy to show the people that it could be done. A laryngectomy, I'm sorry. It's difficult, even in this information society, to understand that people do not access that information. Christine Quinn With all those kind words, thank you, it's a lot of pressure. I better have a really good answer. Bar none, the most important thing you can do is to get more New Yorkers health insurance. You go - the council - hand in hand with the mayor to Albany and demand that the State Department of Health change the enrollment and recertification regulations for Family Health Plus and Child Heath Plus. In the city and state of New York, it's tougher than 37 states or the federal government. I don't know about anybody else, I don't think we need tougher registration guidelines than George Bush thinks we need. And these are all designed because there's this idea that people are trying to steal public health care, although when audits have been done on recertification, the percentage of New Yorkers who are in the program who actually don't qualify are very low, less than five percent. We need to make it easier for the uninsured to get on to Family Health Plus. It will keep them well, but it will also bring money into our Health and Hospitals Corporation. When those folks are on Family Health Plus, yes, we pay 25 percent of that. But if they go in and they're uninsured, our HHC has to pay 100 percent of their care, and it really is disgraceful that Governor Pataki has made it hard for families in need to get this life saving coverage. Dave Weprin: 1.8 million New York City residents are uninsured. That is totally unacceptable. We also must do something, as my colleagues pointed out, to change the Medicaid formulas. Ten percent of our budget -- $5 billion every year -- goes to Medicaid. New York City is the only municipality in the country to pay 25 percent to Medicaid. It's just totally unacceptable, we have to do something about it. I'm very proud of what we've done with health care under the leadership of guru Quinn and Speaker Miller. $3.4 million for AIDS and HIV prevention. $1.7 million for Asian-American Hepatitis-B. $4.8 million for infant mortality. It's not enough. We have to do more. We'll continue to do more. Doug Muzzio: Lew, development. As speaker, how would you, and the council balance the need to accommodate growth citywide and pressure from neighborhoods for downzoning. What are the acceptable tradeoffs? Lew Fidler: I'm living proof that one size does not fit all. There are neighborhoods in this city that are being developed to the point where you cannot recognize them anymore. That's beyond pale. I bought a house in a community, and I hate when someone raises the boogeyman of affordable housing to justify ripping down a one-family home and putting up a three-story $800,000 per unit condominium. That's not affordable housing. There is open space in this city. There are communities where building is appropriate, and I think that that is pretty obvious to those of us that represent neighborhoods, neighborhood by neighborhood. And I'll tell you one thing that I would not do -- and I voted no on before the council -- I would not subsidize the development of communities that would develop themselves. By that I mean the Hudson Yards in Manhattan. The West Side in Manhattan is the most developable land in the free world, and I don't think tax money should have to go pay for it. Joel Rivera: Land use is one of the greatest powers that we in the City Council have, and it's one of the greatest responsibilities we have. We have to take a holistic approach and look at how we develop the land in the City of New York. Some areas of our city need and deserve to create affordable housing, and we have to make sure that the people who help build and maintain our city can actually afford to live in our city. But the fact of matter is there are also neighborhoods - like my colleague Lew Fidler stated, that are full of one-family homes where you want to make sure the character of the neighborhood is something that does not get drastically changed. That's why as the speaker, what I would do is meet with each and every single one of my colleagues and have a comprehensive approach of how we deal with land within their respective communities. And we have to open up the process to make sure that we have these discussions with the developers and with the community organizations, and with the not-for-profits. In the City of New York, one size does not fit all, and we have to take it as a step-by-step approach. Melinda Katz: As chair of the Land Use Committee, this is basically what we've been doing for four years. I actually believe we've been accomplishing quite a bit. In Williamsburg-Greenpoint we've created thousands and thousands of houses, and 33 percent of it is affordable housing. For those of you in the business, you understand truly how relevant that is. We did the rezoning of Hudson Yards, we did West Chelsea, but on the other side, we also downzoned quite a bit of communities. We downzoned Bellerose, we downzoned Forest Hills, we downzoned Bay Ridge. We downzoned communities to ensure that the quality of life remains for the folks who live there in the City of New York. I would say that as chair of the Land Use Committee, there's no one zoning that comes in front of us when affordable housing doesn't come up. Council members inevitably want to have lower heights in their districts, but they want a lot of affordable housing units. So, 20 percent of 1,000 is very different from 20 percent of 2,000. So there are choices that each council member needs to make in their own districts. As chair of the committee, we have made sure that they approve of the project - usually. There are times when there are city-wide perspectives, and it's not always possible, but in general, they have been involved in every negotiation we have had to make sure that we reach a balance in every community, because as Lew said, "One size doesn't fit all." Leroy Comrie: Trying to deal with affordable housing and the issues of development in the city are varied and vast. That said, we have to work with each council member because each district is different. Forest Hills is not southeast Queens, Baychester is not Glen Oaks. We have such a diverse city, but people want to protect the integrity of neighborhoods, people also want to understand, what is affordable housing in this market nowadays. And how can we get to an opportunity for everyone who wants to own property. To do that, we have to work collectively as a council, working with each member, working with our Land Use guru - I'll give her that title also. We've increased the opportunities for affordable housing. We've lowered density where necessary. In Staten Island, we've started an entire task force to deal with downzoning. In my community, St. Albans, Hollis, Jamaica, we're in the process of downzoning to protect the integrity, because no one wants to wake up tomorrow and have a six-story building next to what was once an entire block of one-story homes. So it's a real problem, it's a real crisis. But we have the collective wisdom, and the proven strategies to ensure that all neighborhoods' integrity is protected. Christine Quinn First, I want to clearly applaud Councilmember Katz as chair of the Land Use Committee, because she has done a great job of making sure that when any member had an upzoning or downzoning in their district, that that member and that community's voice is heard. And that's critical to my vision of land use -- that the neighborhoods get to have a voice. That neighborhoods get to have input in the future of their areas. Towards that end, I'd like to make it easier for 197-A (community-based) plans to go through. But when we look at zoning beyond those generated by the community, we need to make sure that neighborhoods have a voice. For example, in West Chelsea, there was an interest in preserving the High Line at the public cost. We wanted that. There were other trade offs as it related to density, but we needed to come to agreement on a matter about to happen. If I was speaker, I would continue the type of land use work I did in West Chelsea and also in the Hudson Yards proposal. We made sure, with the help of the council, that the neighborhood had a strong voice in that. They had input on expanding the number of affordable housing units -- and in particular, the number of permanently affordable housing units, because we need to move away from the trend in this city of creating units that are only affordable for 20 or 30 years. We need to move toward using zoning to create permanently affordable housing, where the income -- low, moderate, middle -- is defined by the neighborhood and the residents of that neighborhood. Dave Weprin: 76.7 percent of households in the city of New York live in housing that is unaffordable. That is really not acceptable. We clearly need more inclusionary zoning. There's certainly ways to work with developers -- with incentives to provide inclusionary zoning -- and call for more affordable housing in the city of New York. We have a lot of residential neighborhoods that need to protected. We've done that with many of our rezonings, we have more to do. We also have to maximize the use of the available land left for development. And my view is we have to allow maximum density whenever possible for developers in exchange for maximizing affordability. The people in this city need affordable housing. The costs in this city are getting higher, the rental levels and sales levels are at an all time high, the city's population level is at an all time high. We have a crisis of affordability such as we've never seen before. The answer in my view - in addition to these rezonings - is a citywide inclusionary zoning program that clearly defines that affordability will be exchanged for density. I think we have to have aggressive Community Benefit Agreements as a part of these rezoning efforts. I think the city provides great value to developers in these rezonings and in the use of public land. We have every right to drive a hard bargain and make sure we maximize for each community. Doug Muzzio: What I'd like to do now is a couple of these quick questions related to development, and I'll start with you Bill. Do you support the city's use of eminent domain to assemble property for private development? Bill de Blasio: I support that right, but I think it should be used rarely and carefully. And I think one of the cases is the Atlantic Yards project in Brooklyn. I think there should be absolutely minimal use, but I think that project offers one of our best chances of providing a significant number of new affordable units - well over 2,000. Creating a model 50 percent affordability in all construction. And of course ensuring local hiring and labor union jobs in the development of that project. David Weprin: I was very concerned with the recent United States Supreme Court decision that basically expanded the right of eminent domain for private development purposes. I honestly believe eminent domain should be major public purposes. There are places where economic development and public purposes can go hand and hand. I would be very cautious about the use of eminent domain if there is not a huge public benefit. Leroy Comrie: I would also support eminent domain, only if we have a full public discourse. Eminent domain that is being used for private enhancement has to have full public discourse. The problem with the Atlantic Yards project is that there is not a full public discourse. There is not community board involvement they're entitled to. If you want to use eminent domain, the entire affected body that would be impacted by it has to be involved, engaged, and has to have an opportunity to have real vote on it. The City Council has to be able to stop it. Melina Katz: Well, as a sponsor of Letitia James' bill, which limits the use of eminent domain for private business interests, it's a dangerous precedent to set in general. Joel Rivera: We need to make sure that we limit the use of eminent domain as much as possible, so that we can preserve the city of New York. In very rare instances, yes, but in most cases - 99 percent of the time - no. Lew Fidler: Yes, but minimally, and only when there's a clear public purpose. Doug Muzzio: Under what conditions? That was part of the original question. Lew Fidler: Only when there is a clear public purpose and a clear public benefit. You know, all of these decisions are cost and benefit. I also support the Atlantic Yards projects. I think that the minimal use of eminent domain there -- while not pleasant, and it would be better if we could avoid it -- does serve a public purpose. Doug Muzzio: Moving to a quick answer round very quickly, then we'll move to closing questions. I guess I'll start with you, Lew. Should the city pay any portion of the Campaign For Fiscal Equity settlement, if so, how much. Lew Fidler: Yes. I would say as little as we possibly can, because the point of the CFE decision was we were being shortchanged to begin with. Joel Rivera: I want to say yes as well, but the fact of the matter is that the court decision states the fact that the state government underfunded our children. Doug Muzzio: How much though? What are we talking about? Joel Rivera: I would say that the state government should pay at least 90 to 95 percent of it. Melinda Katz: I just think it's ridiculous that we're still having this argument. I was a legislator in Albany, when we were getting shortchanged, we're still getting shortchanged. Nothing has changed, excuse the use of the word again. And we should be able to find a way that the state actually pays us the money that we're owed. Melinda Katz: I don't know the answer. I would like to not pick up a thing. I think we should get the money we're owed. Judge Leland DeGrasse ruled that we were shortchanged year after year. Oliver Koppell, myself, Al Vann, Larry Seabrook, that are now in the council, stood up there and fought for years for what we should get in New York City. And I think it's just a shame that we're still having this argument year after year. The council should be angry, every one in this audience should be angry that that argument is still going on. Leroy Comrie: I don't think that the city should pay any money. It's clear that the state has failed in its responsibilities. The governor's going to be gone -- I hope he'll be gone -- in less than a year. Hopefully the culture that he started will be gone also, so that the state can make some real decisions on the CFE. I don't think that we should capitulate one dime. The state has underfunded us for years. They've started this ridiculous lawsuit to get away from they're responsibilities. They need to take us there. Christine Quinn Robert Jackson didn't walk to Albany to get nothing. We need to make sure that, as Melinda said, the state follows through with Judge DeGrasse's orders. I would only want the city to put in money if we absolutely had to. We can't at the end of the day allow them to continue to shorthand the city, but we can't put up so much money that we effectively take them off the hook and make them feel like they never had to give us the money. The courts have now repeatedly said: They owe our kids. David Weprin: Well we've actually already advanced the money. When the mayor proposed cutting $1.3 billion out of the capital budget for education because we didn't have the CFE money, we all stepped up to the plate and said, "Our children can't wait." We have to advance the money, we have to provide for our children. As Christine said, Robert Jackson didn't march up to Albany for nothing. And we all didn't fight so hard. We already advanced the money. Having said that, we have to get it all back from Albany, and we should fight together in Albany and join the mayor in that fight. Bill de Blasio: Yes, in reality we do have to invest more in this. There's a logjam for every state that's gone down this road. We have to break the logjam and ask Albany, including the legislators who are no big fans of New York City, and if that's what it's going to take, we need to do it. We all have to understand that it is all of our responsibility to find a new way, a new solution to this problem. Doug Muzzio: The next two questions are yes or no with no ifs ands or buts, if we can do it. Do you support non-citizen voting in municipal elections? Doug Muzzio: Are business practices for a company like Wal-Mart relevant in land use decisions? Melinda Katz: Won't get the votes otherwise. Doug Muzzio: After your four-year stint as speaker for what do you want most to be remembered? Melinda Katz: My father used to say to me if you ever want to get ahead in life you better do the best job where you are and not worry about the future, the future will take care of itself. As the chair of the land use committee I have tried to do that. Land use has a lot of opportunities to be out there and to do your thing. My thing has always been to work with each council member, come in, and make sure they feel, make sure that their community understands that they are the ones fighting for them. And I am a vehicle to get what they need in their communities. I think that's important. I would like to be remembered as someone who brought this body together, someone who made it a co-equal body with the mayor of the city of New York. When the mayor only has four years without a reelection, we stood up to him to make sure we get our money, our budget, and our land use items that we need for our constituents. Leroy Comrie: I would like to be remembered for being the most engaging council member with the entire city. I'm a New Yorker, I like to debate. I like to argue. I like to engage and find out information. I like to pick people's brains. But the key people's brains that I want to pick are my fellow members because none of my members should be disengaged from the political process that they fought so hard to get there for. I want to make sure in the next four years that this entire city is part of the political process because we do have an incumbent mayor that believes he has a mandate. We have to rise up when ever he is wrong, and he can be wrong at times, to make sure that council is the proper legislative advocate to make sure that the right thing is done. Christine Quinn I'd like to be remembered as somebody who helped further unite the council and make the council even more effective, someone who empowered council members so that each member could accomplish more, not only for their district, but also on citywide issues. I'd also like to be remembered as the speaker who helped bring the council together to achieve even more forward motion on education and for our kids in this city. David Weprin: My father always told me, "Study hard, do the right thing, and someday, you may be speaker too." All kidding aside, I want to remembered as open-minded, honest, and fair. Bill deBlasio: I'd like to be remembered as a leader who helped strengthen the City Council, who helped it in that path of evolution that was begun 20 years ago by Peter Vallone, Sr. to make it the strong check and balance and partner in government to the mayor. I think what we are seeing this evening, if all OF New York City could see the commitment levels of everyone up here, their knowledge of the issues, their concern for their communities, I think there would be an even greater faith in the council as that check and balance. I think we can do that together. I think we use it as a bully pulpit to ensure that the issues like the Campaign for Fiscal Equity case in Albany do not go unanswered and get resolved. Lewis Fidler: Well I'd really like to be remembered as the best dresser, but I know that ain't happening. Truthfully, I would like to be thought of as someone who brought out the best in my colleagues. I guess if there is a substantive area to leave a legacy in, it would be on behalf of the children of this city to make sure that they are not forgotten, even though they don't vote. Joel Rivera: There is a big misconception about the City Council when people talk about the council as a rubber stamp. We have substantial power in terms of land use and budgetary issues. What I want to be remembered as and what I want the body to be remembered as is a council that is engaged with the public, and engaged in ensuring that the public have a voice that can be heard. I think that Gale Brewer in her efforts to make sure that technology is an pivotal part of our council is extremely important. We need to make sure that we bring the council into the 21st century and beyond to make sure that people can be engaged. I want to make sure that each member understands that we need a united body. At the end of the year, after 365 days of long hard work, I want to make sure that every member feels comfortable with our administration.